I knew for Halloween this year I wanted Parker to create his own pumpkin masterpiece. Since carving was obviously out of the question, I picked up a little white pumpkin to have him paint. 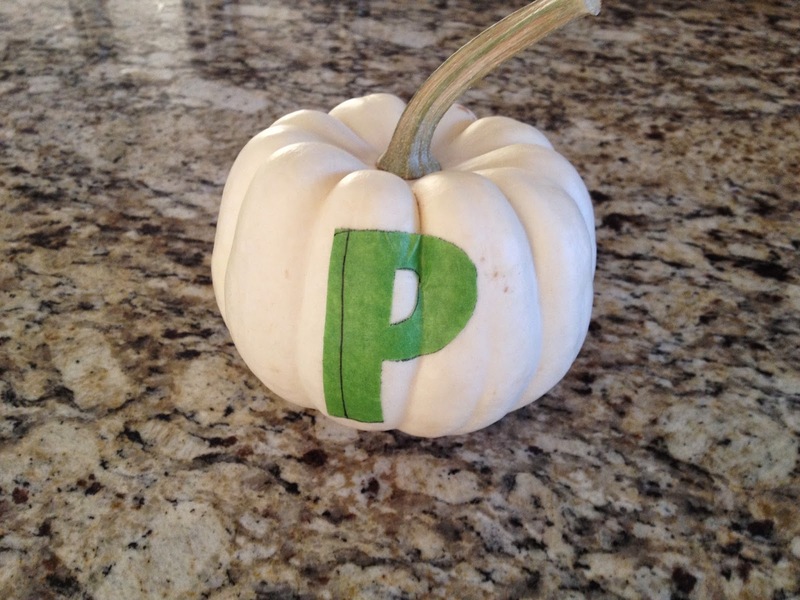 I exacto-ed a masking tape "P" to place on the pumpkin with the intention to peel it off after he was finished to reveal a white "P" for Parker - a reverse stencil. Just like everything, the paint went straight into Parker's mouth. I anticipated this and purchased Veggie Tempera paint over something more permanent and toxic. He needed some prompting from Mamma and Dadda, but little man got the hang of it and painted with both his fingers and the correct side of the brush (not shown in this photo, ha!). And when he was done, he was done. He wanted to hold his paintbrush still, but began walking about the yard, checking out the sprinklers, the bushes, the ants. 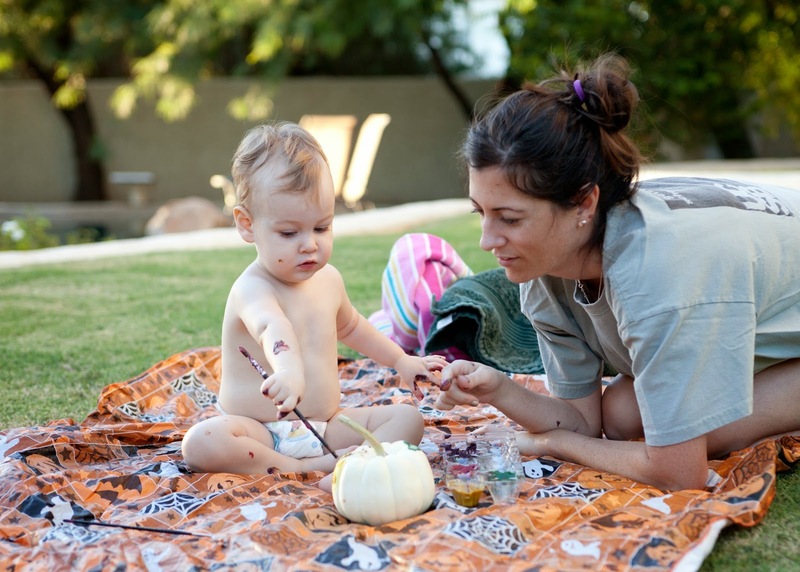 He painted a good half of the pumpkin (and of course as his mommy I thought it was the best thing I'd ever seen). Since the paint Parker was using was veggie based (as well as non-toxic and completely safe to eat) I wasn't really sure how it would hold up, or if it would paint at all. It was more important to me to get something safe since I knew it was going straight into Sweet P's mouth. Turns out that it worked, but dried a bit dusty and flaky. 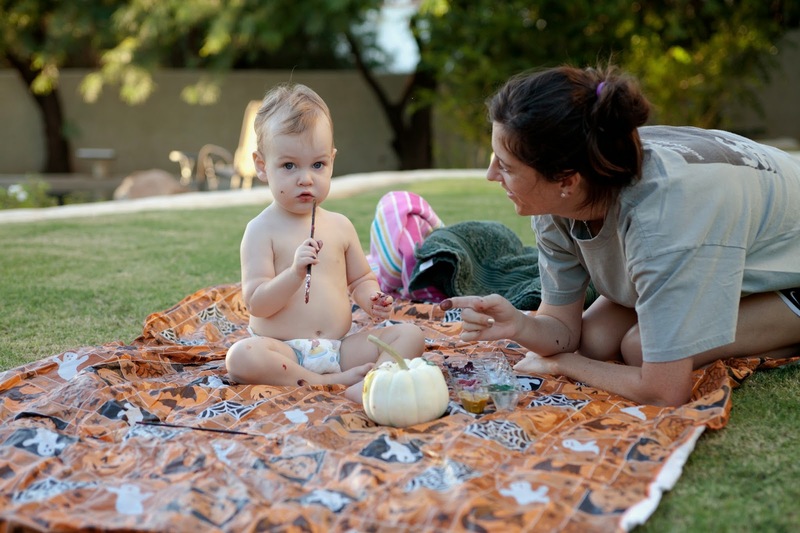 While you definitely won't mistake the finished project for traditional Crayola paint, it did do its job placing color on the pumpkin and Parker wouldn't have known the difference anyway. After reading lots of reviews, I went with the Wee Can Too Veggie Tempera Paints . It seems like anything safe to eat is not going to be the same as regular paint, so expectations have to be adjusted. 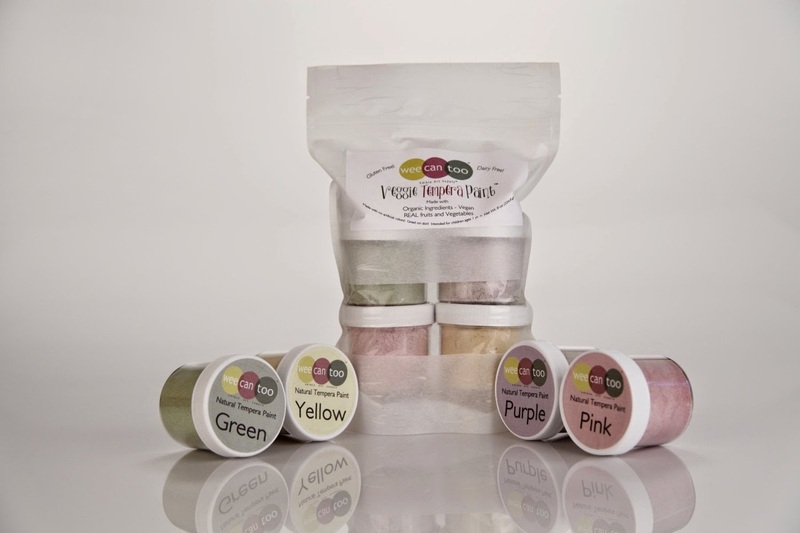 The veggie paint also seemed pricey (about $7.50 per tub) however the paint comes in powder form, so you can mix (with water) just what you need and save the rest for later. I think they will last us a long time! 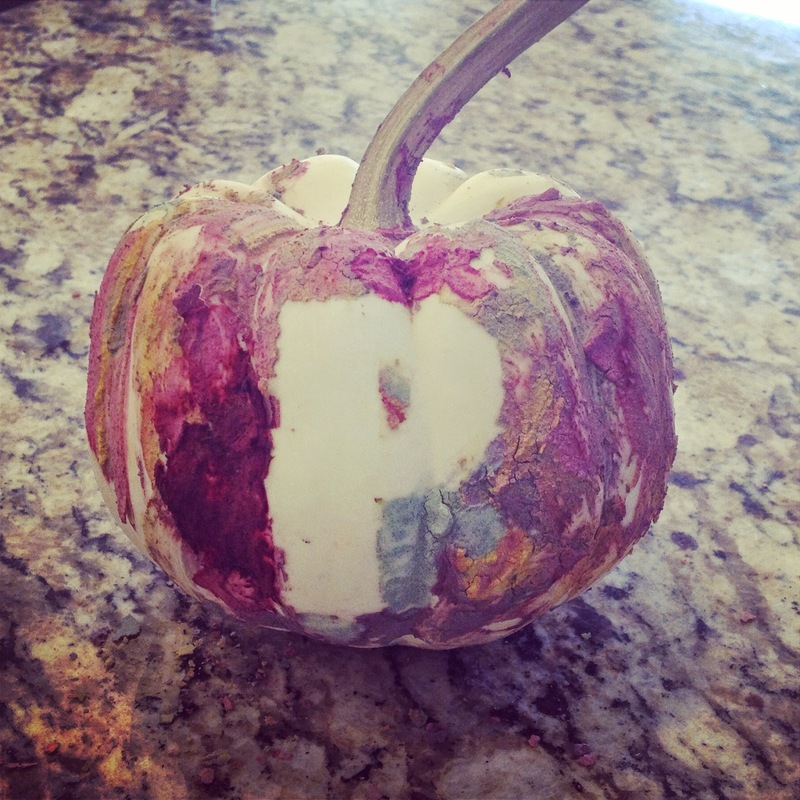 After letting the paint completely dry, I carefully peeled off the monogram "P" off the pumpkin and voilà! Parker's first masterpiece!